We offer you Custom Wedding Decorations, Church Bows, Pew Bows, Wedding Cake Toppers, Bridal Bouquets, Colors to compliment many of the most popular bridesmaid dress colors including those offered by David's Bridal, Alfred Angelo and Mori Lee to name a few. Which include popular colors like Palm Beach Coral, Eggplant, Chocolate Brown Apple Red, Aqua Blue, Tiffany Blue, Teal, and many more. We have Satin Bows, Tulle Bows, Satin and Tulle mixed Bows, Tulle Pew Bows, Church Bows, Wedding Bows, Reception Decorations, Alter Arrangements, Table Centerpieces, Birthday Decorations, Sweet 16 Decorations, Spring Wedding, Summer Wedding, Fall Wedding, and Winter Wedding Decorations, etc. We will also help you decorate your Bar Mitzvah, Bat Mitzvah, Quinceanera, Birthday, Anniversary, all Celebrations & Occasions! We are here to help you make the moment even more memorable! We have been in the wedding and all occasion decorating business since 1998, and we pride ourselves on providing customers with the best-quality "All Occasion" products and personal service. We have many wedding pew bows and colors to coordinate with your Davids Bridal, Alfred Angelo & other Wedding Dress or Bridesmaid Dress makers. You can order from us using our easy to use online catalog by clicking on any of the pictures! Add a touch of elegance to any special occasion anywhere! 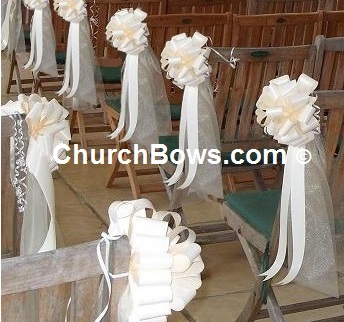 Add our bows to pew ends for the most beautiful look at weddings or to church pews, backs of chairs, garden chairs & gazebos, banisters, railings, signs, candelabras, archways, etc. 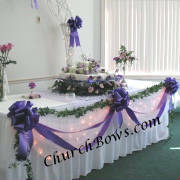 Our bows are an inexpensive, versatile and beautiful way to decorate the church and wedding reception area. We offer more shades of colors than anyone in the USA to beautifully compliment your wedding colors. Including a hard to find Eggplant Purple, Tiffany Blue, Tealness, Watermelon Pink, Palm Beach Coral, Apple Red, and many others. We take an enormous pride in creating our products, and hope that you'll find something on our web site that you like. 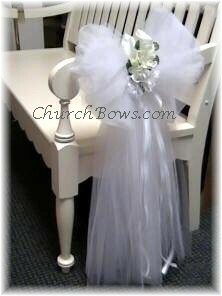 We also can create custom orders; such as bridal bouquets with your choice of flowers and colors, Tulle Pew bows, Satin Pew Bows in your colors, Wedding Decorations in many styles. contact us and let us know what you want. We look forward to doing business with you. Click on picture to start shopping! We carry many different colors. We can make single/solid color bows, two color mixed bows, three color mixed bows, four color mixed bows, five color mixed bows and on up to six color mixed bows. That's six different colors in one bow. So if you are looking for the colors of a rainbow in one bow this is the place to get it! In other words if you have choosen more than a few colors for your wedding, or special event, dont' worry we can help! We have bows for huge gifts like a new car, atv, appliances, etc. Just click on the picture to the left and we will take you to our store! We carry many different colors and types of flowwers for our beautiful alter and table centerpieces as well as different sizes to choose from. We can make single/solid colored arrangements or maulti colored arrangements to fit your style. So if you are looking for this or something special for your wedding, or special event, dont' worry we can help! We can make Bows up to 36" inches in diameter "Thats 3 feet wide"
Not only do we specialize in offering more colors. We also specialize in offering many verities of sizes to choose from. If you want it and we don't have it, we do our best to make it or find it for you! Our Larger Bows start at just under $3.99 each! We offer many custom bows. We can add your colors, your types of flowers and more. We have a large selections of just tulle, just satin, and also tulle and satin mixed bows. We can add the small floral arrangements in your colors to each one. We offer many custom bows. We can add your colors, your types of flowers and more. We have a large selections of just tulle, just satin, and also tulle and satin mixed bows. 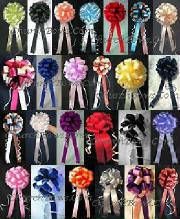 Some bows we can add the small floral arrangements in your colors to each one. 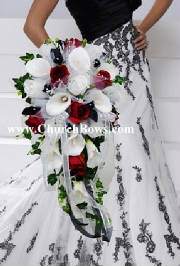 We offer many custom bouquets. We can add your colors, your types of flowers and more. We have a large selection of Bridal Bouquets, Bridesmaid Bouquets, Corsages, Boutonnieres and Wedding Flowers in Packages . 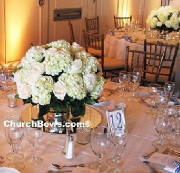 We also make Table and alter arrangements. We are not associated or affiliated with David's Bridal, Alfred Angelo or other dress makers in any way. We just sell products that coordinate with many of the colored dresses they sell. Wedding Pew Bows, Bridal Bouquets & Accesories, Bar Mitzvah, Bat Mitzvah, Quinceanera, Birthday, Anniversary, All Ocassion Decorations! Copyright © 2016 ChurchBows™ All rights reserved.